Arrange the pears cut side up in a baking dish or a iron cast skillet. In a small saucepan over medium high heat whisk the grapefruit juice, lemon juice, and sugar until the sugar dissolves. Whisk in the butter. Pour the sauce over the pears. Bake for 30 – 35 minutes, or until the pears are tender-crisp and beginning to brown, basting occasionally with the juices. Remove from the oven and let cool slightly. 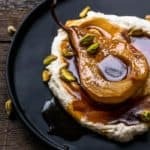 Serve warm with a good dollop of ricotta, Greek yogurt, or ice cream, sprinkle pistachios and drizzle with the pan juices.